Yes! I knew he'd be appearing this year at E3 this year! I'm looking forward to the remaster of the three original games! Hopefully they'll stay more true to your concept design, especially for Crash, Hope they don't give back his old douchey appearance. (Sorry for the language.) But very awesome art and it's great that the Bandicoot is finally back! I'm so happy that my favourite games of all time are getting remastered for the new generations! A new legion of Crash fans is coming! This is a game where players can buy a figure of a character and play with it in the game, Spyro is in it too and his design looks more like a Gremlin than the actual classic Spyro, but for Crash they wanted to nail his appearence. The developers said that they got inspirations from Willie the Wombat concepts, so they probably used your drawings. Please contact Vicarious Visions and tell them to get Joe Pearsons to supervise the art direction for the new Crash 1, 2 and 3 reboots. It's you the fans who did it! A big congratulations to everyone! Yay I still can't believe it but it happened! That's so cool! Already this summer is turning out great. 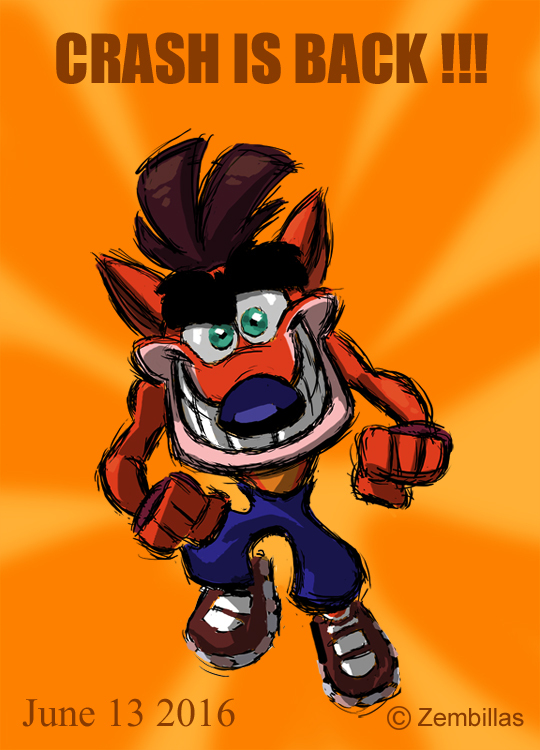 Congratulations to both the fans and you Charles, for all the Crash drawings you did to show the game industry that we still want Crash Bandicoot. Heres a piece I did in dedication to both the 20th anniversary and for the future. Hunter H and Parveen really enjoy seeing your Crash art. Nice work guys! Yes! Now only if Spyro were to do the same. Hey Charles, I have a random question for you, but it's based on Crash Bandicoot, so I guess it has some correlation to this topic. I'm asking because I'm making a model of Aku Aku (and eventually Uka Uka in Autodesk's 3ds Studio Max, and the last thing I have to do is his feathers, and since I'm trying to design him based on your vision and sketches, I want to get it as close as possible. Hi T Evans. The final number of feathers was a decision that Naughty Dog made. When I designed Aku Aku it was pretty much along the lines of a suggestion based upon their description of the character and utilizing that input into the design process. The final decision of what he would look like was theirs when they modeled the character for the game. So with that go ahead and do what ya gotta do. Hope this helps. Good luck! Good to see you again! I'm sure you're aware of the news that Crash is back again! What's even better is that your colleagues at Vicarious Visions are the ones bringing him back! I just want to thank you for your undying support for keeping interest in the franchise through your art. Without your help, we wouldn't know what to do. You've done so much to help us through. Thank you!